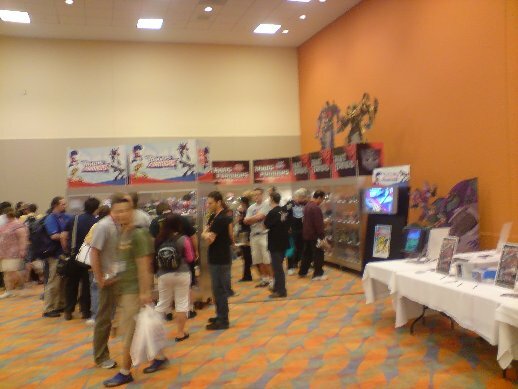 In one corner of the Dealer Room was the Hasbro Product Display. 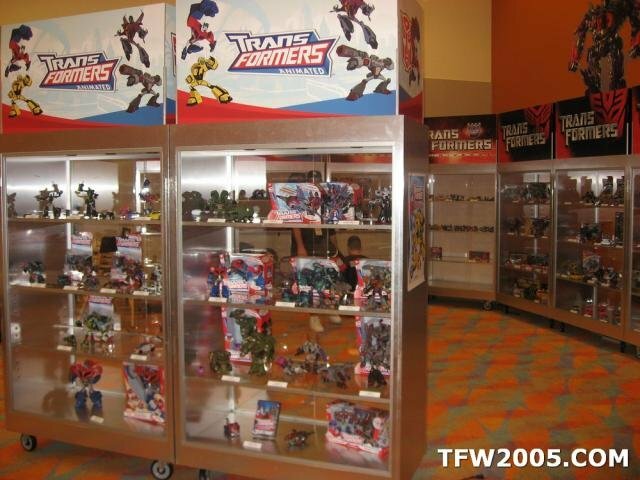 Below is a photo from TFW2005 website, showing the Hasbro corner before the fans were let in. 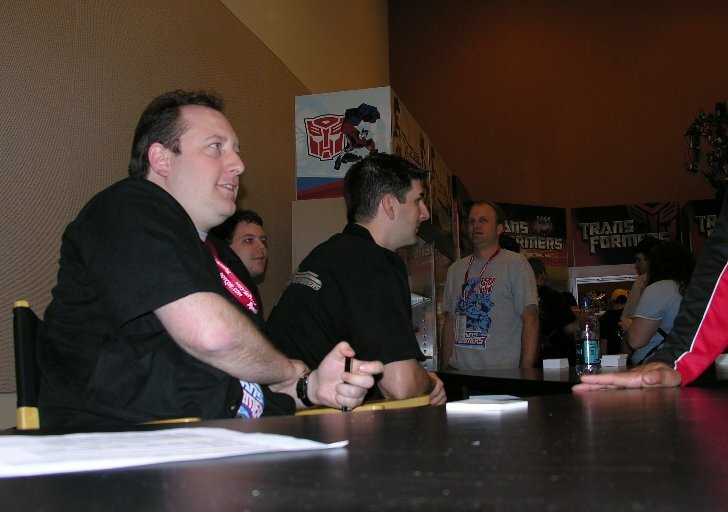 The Hasbro desks. 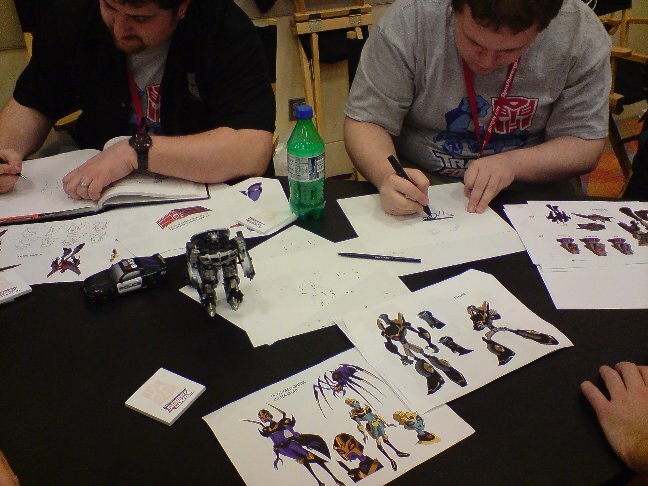 Seemed to be a lot of time spent by most of the Hasbro people drawing copies of Animated Character Model sheets for fans. 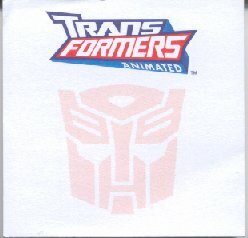 A closer photo of one Animated Character sheet (Ultra Magnus), and one of the post-it pads they were giving out as their 'freebie item' for this year. 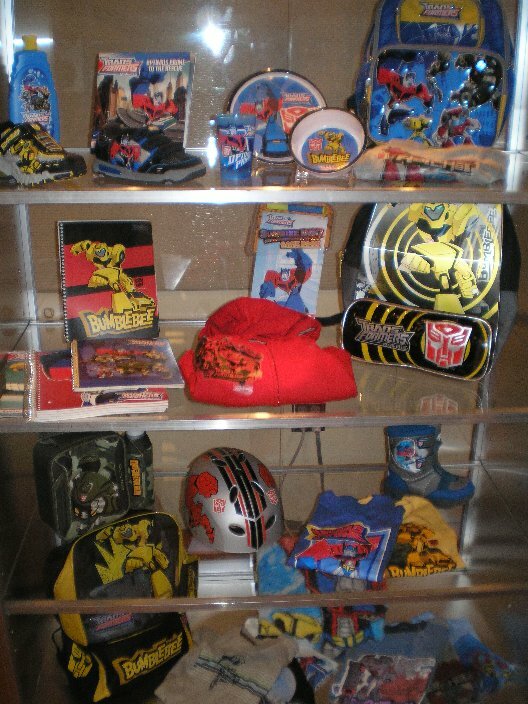 Below are Animated Cast Group Shot Cardboard displays - one on each end of the Hasbro corner like Bookends. 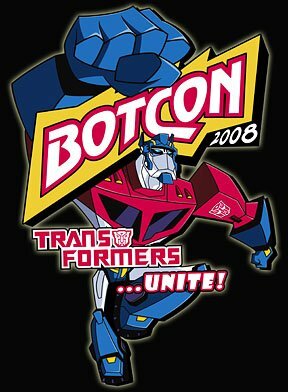 Photos from BotCon Website. 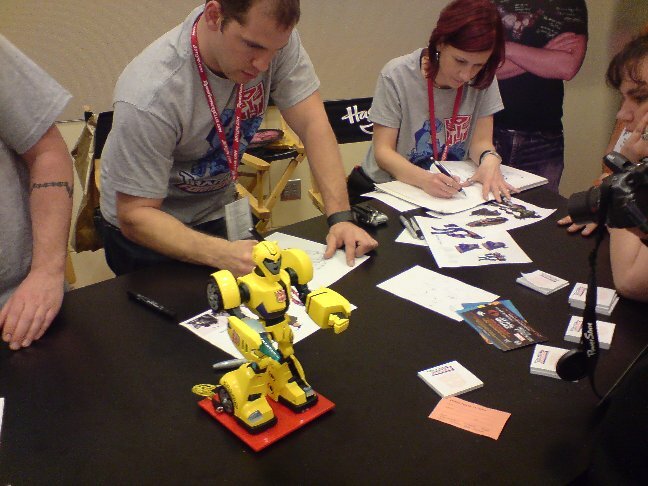 The life-size Cardboard Standin of Hasbro Designer Eric Siebernaler, who is currently in Australia for six months (probably on holidays). 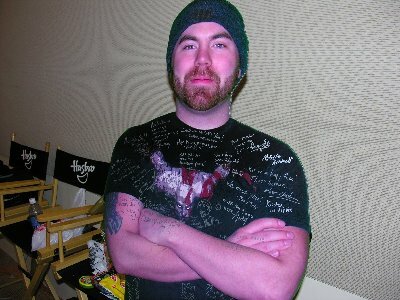 Fans could write messages on it, and it was going to be sent to Australia to Eric. Animated Deluxes, first Wave - Prowl, Lockdown, Optimus, Bumblebee. 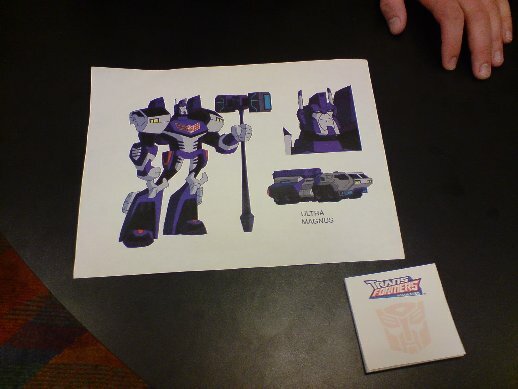 Animated Deluxes - Soundwave with Laserbeak, Snarl, Blackarachnia, Autobot Jazz. 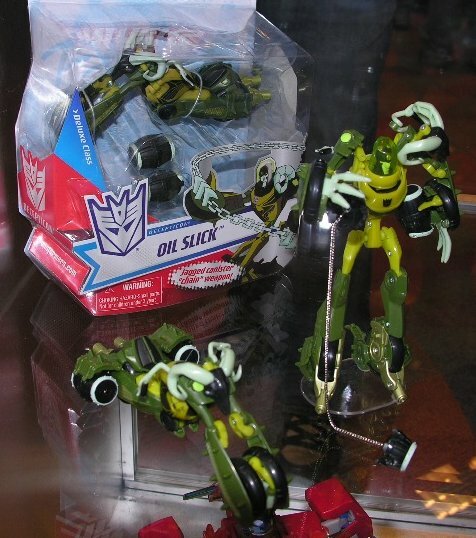 Animated Deluxes - Oilslick, Sentinel Prime, Swoop, Autobot Ratchet. Animated Supreme sized Optimus Prime. Voyager Size wave one - Bulkhead, Starscream, Megatron. Animated Voyager - Optimus, Lugnut, Grimlock. Animated - Leader size Bulkhead with Headmaster Head, Voyager size Blitzwing, Leader size Megatron. 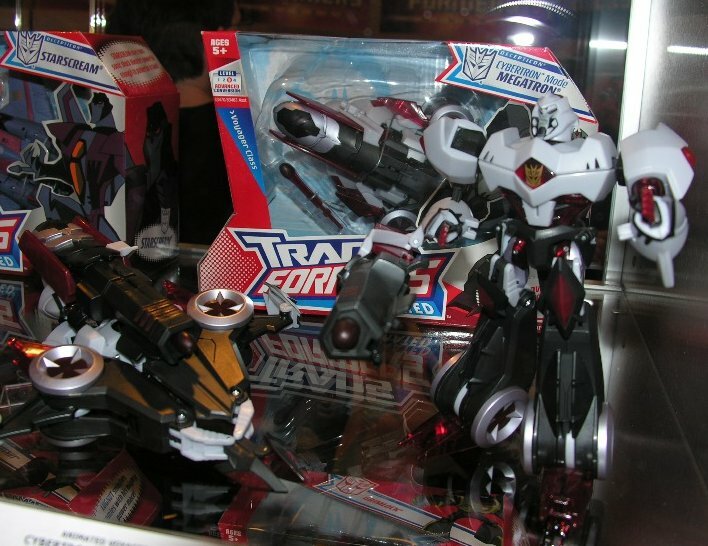 Animated 2-pack Optimus Vs Megatron with DVD. 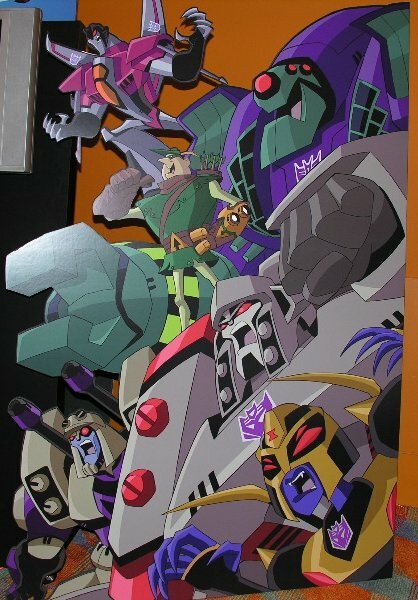 Animated Activators - Starscream, Bumblebee, Bulkhead, Lockdown, Ratchet, Optimus, Patrol Bumblebee. Animated Shift Tech Game, Cyberspeed Bumblebee. 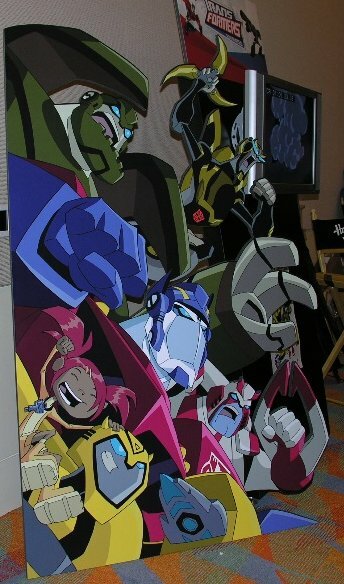 Animated Bumper Battlers - Bumblebee, Bulkhead, Ratchet, Autobot Jazz, Optimus Prime.